Amazon: Put our ALWAYS ON MICROPHONE in your house, please. WHAT? Somewhat out the blue, Amazon is flogging a new gadget called Echo – which is a cross between ice maiden Siri and wireless speaker system Sonos, and will save you having to using your fingers ever again. The Echo is a voice-activated 9-inch-high cylinder that connects to your Wi-Fi and will answer spoken questions, play music, and generally hang out in your home listening to everything you say. And processing it in the cloud. All day. If the promotional video is to be believed, the Echo sounds a lot like Apple's voice-controlled personal assistant Siri, and it can be programmed to respond a particular name – in the video's case, Alexa. The lengthy vid featuring a family with two kids shows them using it for everything from telling them the time and how to spell words to playing music and news programs. It will be available "in the coming weeks" according to Amazon, and will cost $199, reduced to $99 for Amazon Prime members. Somewhat confusingly you have to click on a button to request an invite to be allowed to buy one. According to Amazon, each Echo is "connected to the cloud so it's always getting smarter". 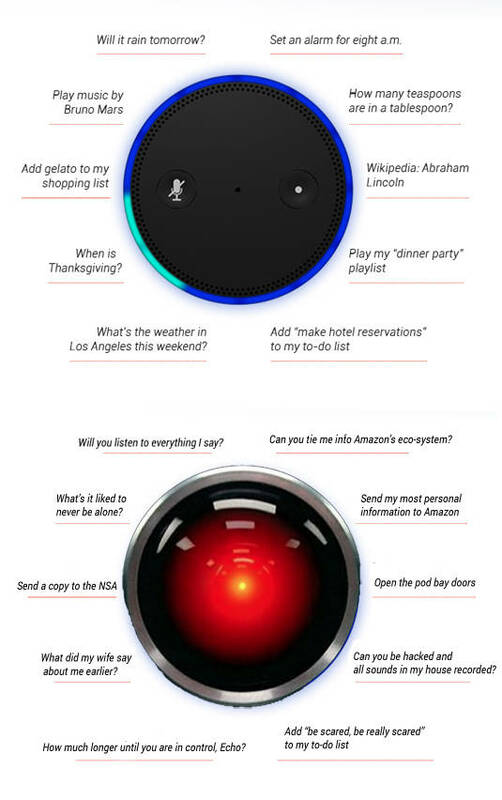 Like a small black version of HAL 9000 in your own home. Of course, it's impossible to judge the success of this thing until you are able to test out: how accurate it is, how well it is able to hear your voice, and the audio quality. It took Apple some time to get Siri right. The idea of yelling: "ECHO - WHAT TIME IS IT?!!!" and barely being able to hear the response "Grandmaster Flash is an American hip-hop artist…" is not appealing. The Echo has two speakers – a 2-inch tweeter and a 2.5-inch woofer – with a "reflex port" to provide bass without distortion. It has Bluetooth so you can use it to stream music from Pandora, Spotify etc.